This Die Set is so beautiful! I love how it frames the shadowbox so beautifully. Gives a project such amazing dimension. This is what the Dies actually look like. These butterflies are drop dead gorgeous!! 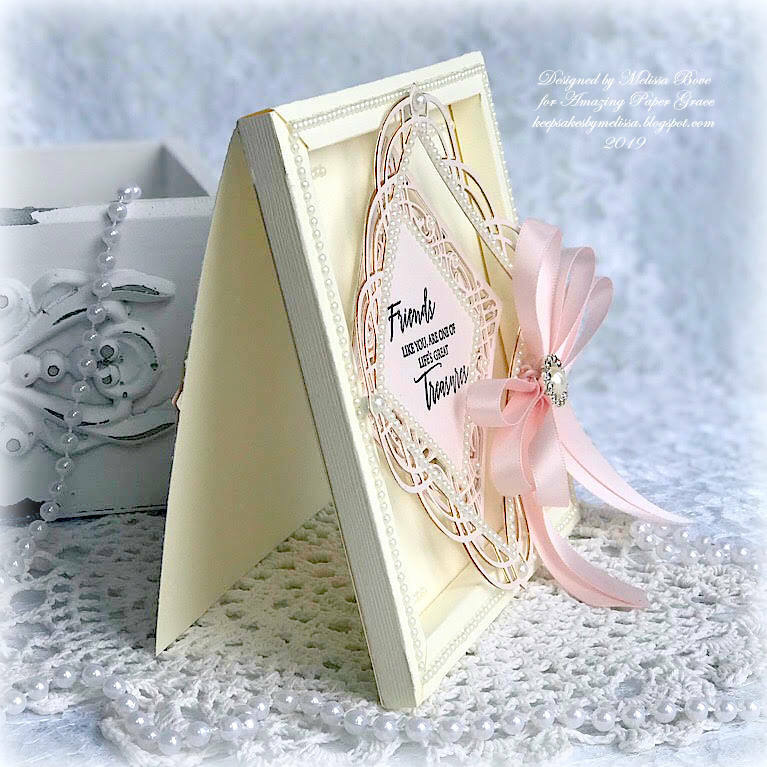 Perfect for a shadowbox, card or layout. 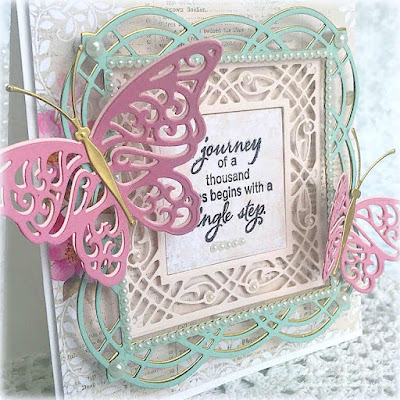 I simply die cut 2 butterflies out in 2 shades of pink and layered them over one another. I then added the body in gold to give it some glimmer. This is what these Dies look like. 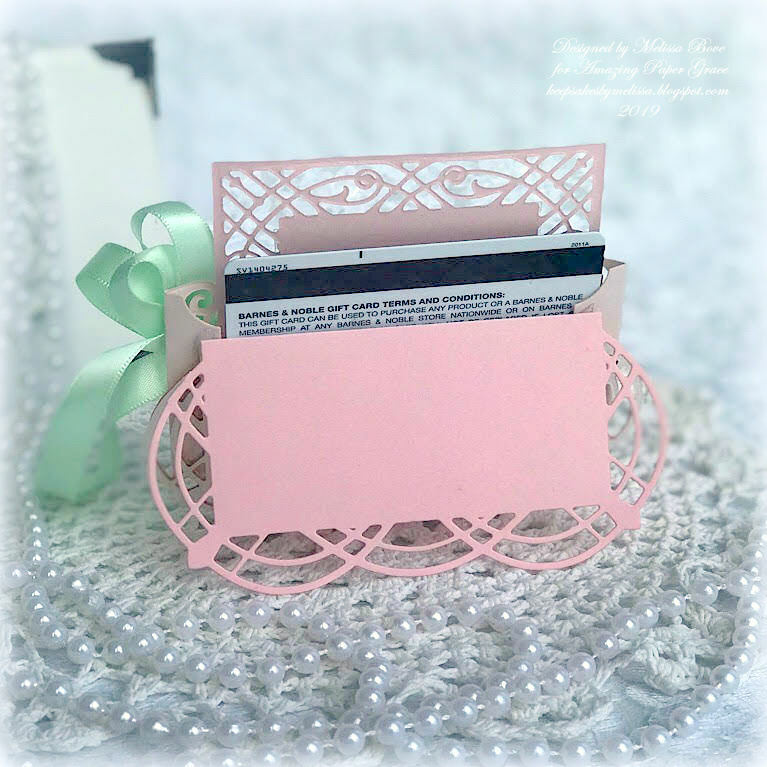 I made a simple and quick, Gift Card Holder with the Adoria Square and Filigree Easel and Pocket Dies. 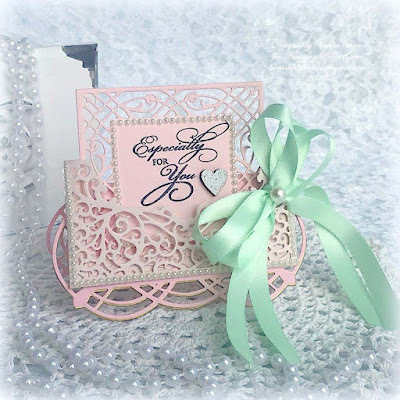 This could also be a great place card setting as well. I simply die cut the Adoria Square Die and folded it in half. I then cut off 2 of the swirls on either side to make it cleaner. 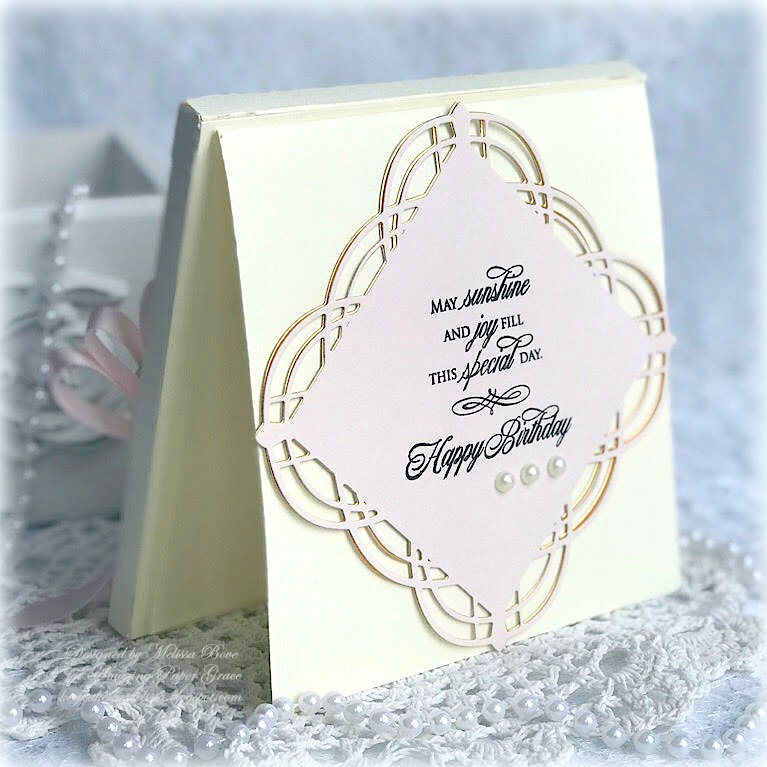 I then adhered the Filigree Pocket to the front to act as a holder for the little note and gift card. This is what that Die looks like. 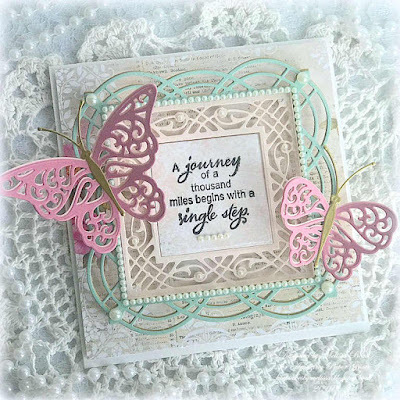 Visit Melissa – keepsakesbymelissa.blogspot.com ~ You are Here! Wowsers!! 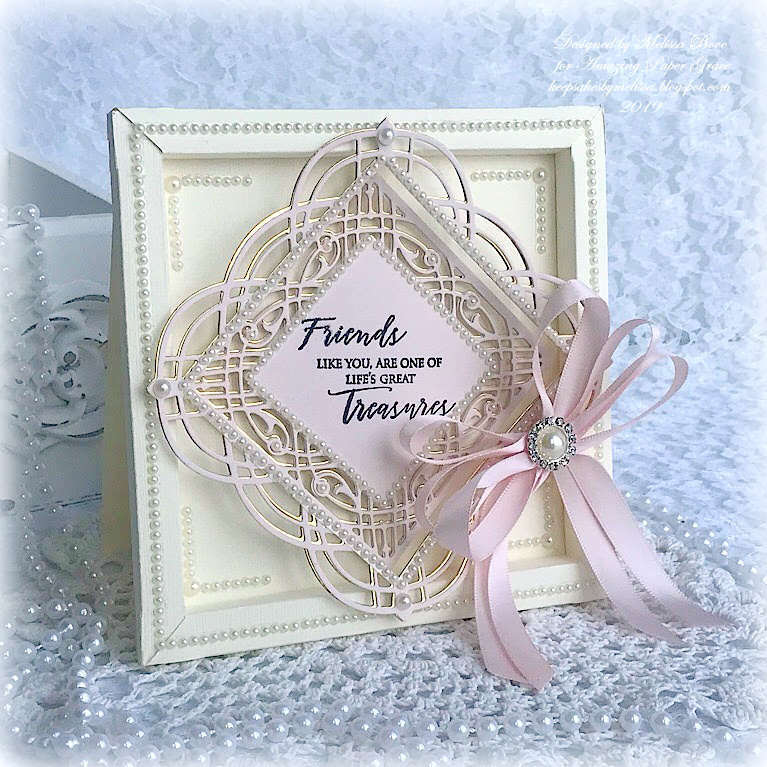 So many gorgeous ideas to use with these dies :) I love that little gift card holder, how wonderful to only fold the piece back to make this amazing creation!! Thanks for sharing these ideas with us. This is the picture of elegance!! I love how you turned the square design on point - brilliant! Oh and that gift card! Words cannot even explain how clever and gorgeous it is. I'll be adding that one to my bag of tricks for sure!! Beautiful Creative Works of Art to receive and display on one's mantal or display case. Love it especially, "hidden" gfit card "pocket"...Well Done! Gret Job! Wow, these are so beautiful! An amazing array of projects! These are breathtakingly gorgeous! I can't wait to make one. Outta the park!! Just gorgeous especially the way you attached the card to the back. They are wall hangers for sure!!! Beautiful! I love how you offset the Adoria square, letting that little bit of gold make it really stand out. These new dies look so fun! These are wonderful projects!! Such a creative use of the dies!! Wonderful ideas. Love the gift card holder. Three really gorgeous creations, Melissa! I love the gift card holder but you really grabbed my attention with the butterflies. 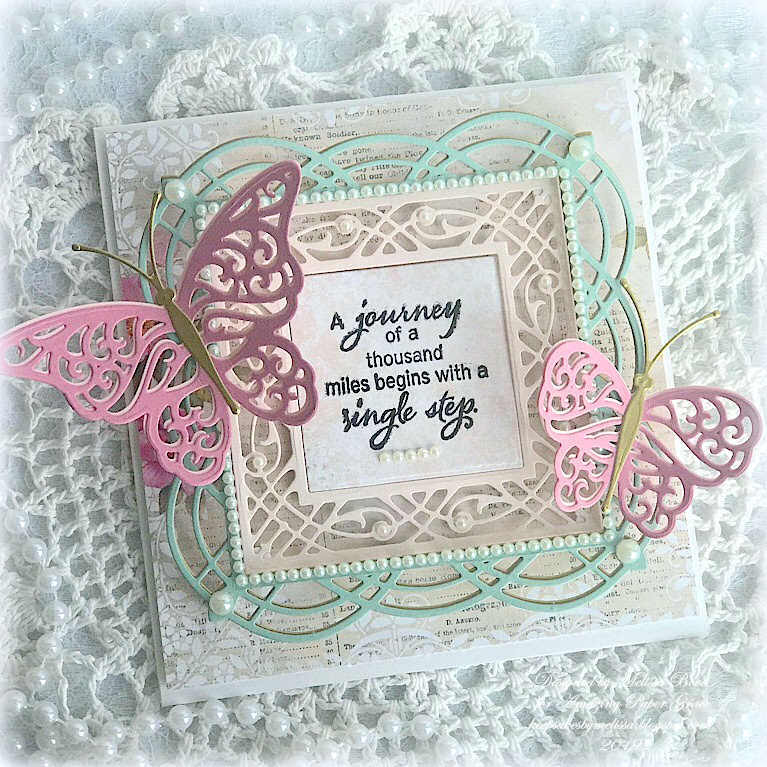 I just love butterflies and I use them a lot on my cards so this set of dies is destined to be a favorite. WOW! All three of these projects are absolutely gorgeous! I think my fave is the card/gift combo; another genius take on this die set. You are amazing. 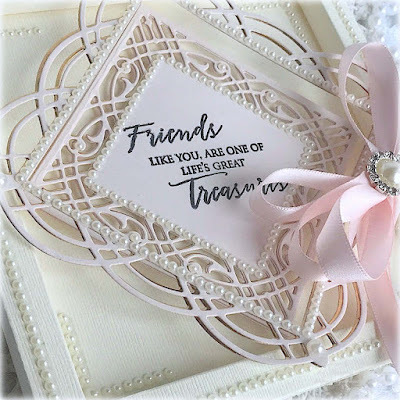 Absolutely stunning projects & amazing dies. You have blown me away with your projects! 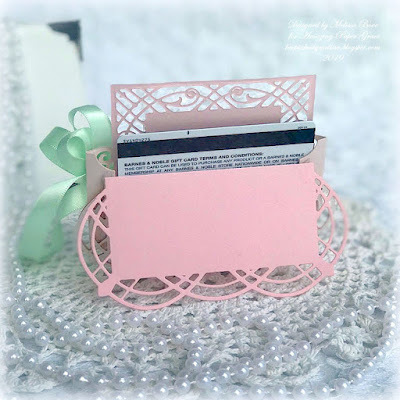 Such a creative and GORGEOUS gift card holder. And your first card with the shadow box on front with the sentiment on back...awesome idea! Thanks for sharing! Have a happy, crafty day! Very elegant and the gift card idea is awesome. Thank you. Thanks for another great way to stand up the shadow box! In fact, seeing that, I bet if the box were the same size as a decorative die, it could be used in the same way... gonna hafta try it!! OH... How great to see another way to use the easel die! Love seeing ideas for extending the use of our dies and will bookmark this to refer to when mine comes - thx! Gorgeous designs. Love how you used all the pearls. Oooo... butterflies! Like the easel even better! Thank you for sharing your creativity! Wow I love all your beautiful creations especially the first one, "Friends". If I were a winner I'd appreciate any die in the Gilded foils collection. Melissa all of your work is so lovely and creative. you really know how to get the inspiration flowing. if I win I will pick a die to use for my daughters upcoming graduation. These are so beautiful! Lovely ways to use the dies. Your projects are so elegant and I love the colors you used. Just gorgeous! I love the design and the dimensionality of your projects! TFS! Your pretty GC holder would also be beautiful at a wedding table! Just gorgeous. They are all so elegant. Love all your creations! This is an awesome concept! Your projects are spectacular and gorgeous! Wow! Thanks for the inspiration. What beautiful creations! 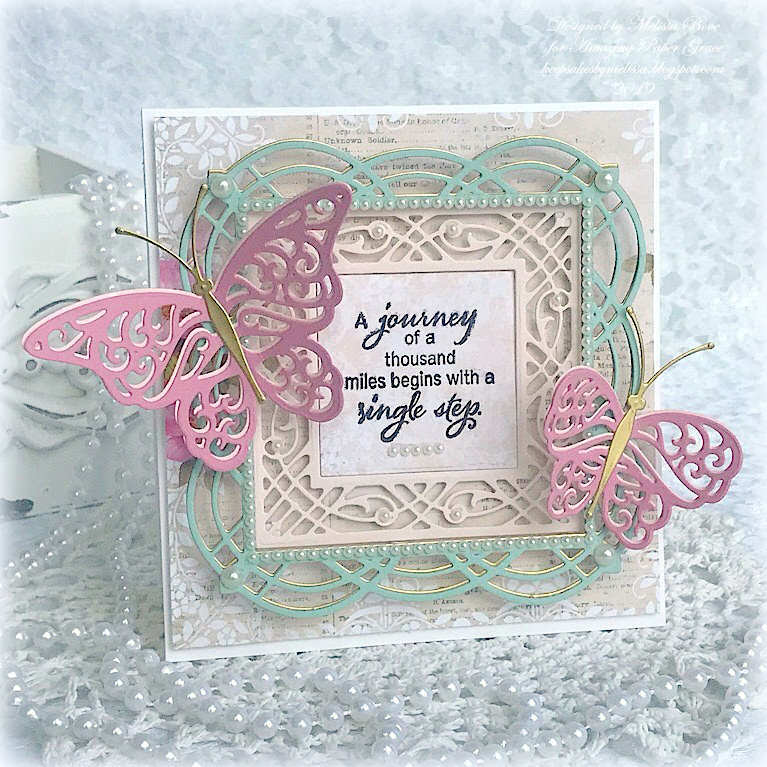 I especially love the card with butterflies ....I have 3 papillon dogs....so butterflies have a special place in my heart. The gift card holder is awes too. I really get excited about projects that are beautiful and have a “purpose “ too! Thank you! 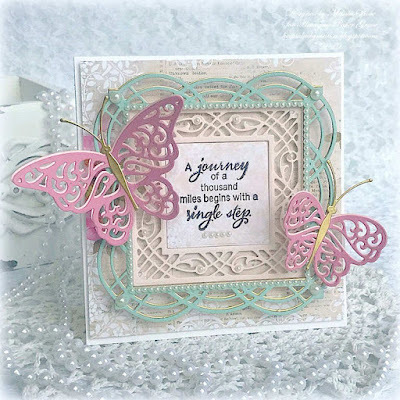 You have such creative ways to showcase these new additions to the Amazing Grace dies! Love how you used these dies! So pretty! Hello Melissa. Both of your shadowboxes are simply wonderful. The colors and designs are very elegant. I also thought the third project using the easel die was very clever and I will definitely try your idea of using it for place setting cards. Thanks for all of the great inspiration. What beautiful creations! I love all the dies. Your projects are simply breathtaking! Beautiful palettes on each piece, gorgeous embellishments and fab designs. Thanks for sharing your creativity with these amazing products. I just love the amazing way your mind works!! What a great idea to use the same dies in such different ways!!! Your creations are so lovely and elegant, I want to cut dozens & play all day!! !